ClubCoins Needed: 135 Games are not compatible with mobile and tablet devices. Please add this title to your Wish List and sign on to your the first club account from a desktop computer to complete your redemption. NOTICE: Requires the base game Cities: Skylines in order to play. Activation key must be used on a valid Steam account. Requires internet connection. About the game	Natural Disasters features a catalog of catastrophes to challenge mayor-players everywhere, including planning with early warning systems and emergency routes, devastating and destructive disaster effects, and caring for the popula… ce as they struggle to rebuild. 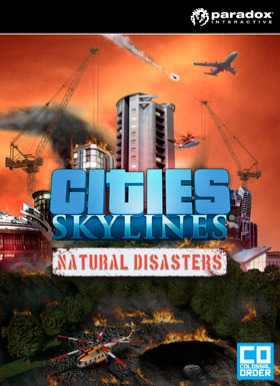 The expansion will also update Cities: Skylines with a new scenario editor and gameplay mode, allowing players to finally win – or lose – the game on their own terms.Key Features Deep, Impactful Gameplay: Keep your city going through the devastation of several possible doomsday scenarios, from towering infernos to the day the sky exploded With Great Power Comes Great Response Abilities: Plan for, and respond to, disasters using early warning systems, countermeasures, and new disaster responses such as helicopters and evacuations – finally, a Paradox game where “Comet Sighted” actually means something An Objectively Good Feature: Scenario Mode - Natural Disasters expansion includes 5 pre-made scenarios to challenge disaster masters, with custom game objectives such as starting cities, win conditions, time limits, losing conditions and more! The Natural Disasters Scenarios expands on the Scenario Editor, which is a free update for all players that allows them to create and share their own custom made scenarios Chirpocalypse Now: Heck yeah, new hats for Chirper Radio Saved the Video Game: A new broadcast network is introduced, helping to rapidly spread evacuation warnings and emergency alerts	System Requirements Windows - MinimumOS: Microsoft Windows XP/Vista/7/8/8.1 (64-bit)Processor: Intel Core 2 Duo, 3.0GHz / AMD Athlon 64 X2 6400+, 3.2GHzMemory: 4 GB RAMHard Drive: 4GB free hard disk spaceGraphics: nVIDIA GeForce GTX 260, 512 MB / ATI Radeon HD 5670, 512 MB Windows - RecommendedOS: Microsoft Windows XP/Vista/7/8/8.1 (64-bit)Processor: Intel Core i5-3470, 3.20GHz / AMD FX-6300, 3.5GhzMemory: 6 GB RAMHard Drive: 4GB free hard disk spaceGraphics: nVIDIA GeForce GTX 660, 2 GB / AMD Radeon HD 7870, 2 GB/li>	Linux - MinimumOS: Ubuntu 14.04 64-bit Ubuntu 14.10 64-bit Ubuntu 12.04 64-bit Ubuntu 14.04 (64-bit)Processor: Intel Core 2 Duo, 3.0GHz / AMD Athlon 64 X2 6400+, 3.2GHzMemory: 4 GB RAMHard Drive: 4GB free hard disk spaceGraphics: nVIDIA GeForce GTX 260, 512 MB / ATI Radeon HD 5670, 512 MB	Linux - RecommendedOS: Ubuntu 14.04 64-bit Ubuntu 14.10 64-bit Ubuntu 12.04 64-bit Ubuntu 14.04 (64-bit)Processor: Intel Core i5-3470, 3.20GHz / AMD FX-6300, 3.5GhzMemory: 6 GB RAMHard Drive: 4GB free hard disk spaceGraphics: nVIDIA GeForce GTX 660, 2 GB / AMD Radeon HD 7870, 2 GB/li> Mac - MinimumOS: OS X 10.10 OS X 10.9 OS X 10.9 (64-bit)Processor: Intel Core 2 Duo, 3.0GHz / AMD Athlon 64 X2 6400+, 3.2GHzMemory: 4 GB RAMHard Drive: 4GB free hard disk spaceGraphics: nVIDIA GeForce GTX 260, 512 MB / ATI Radeon HD 5670, 512 MB	Mac - RecommendedOS: OS X 10.10 OS X 10.9 OS X 10.9 (64-bit)Processor: Intel Core i5-3470, 3.20GHz / AMD FX-6300, 3.5GhzMemory: 6 GB RAMHard Drive: 4GB free hard disk spaceGraphics: nVIDIA GeForce GTX 660, 2 GB / AMD Radeon HD 7870, 2 GB/li> © 2015 Paradox Interactive™. Trademarks belong to their respective owners. All rights reserved.